THIS POST IS DEDICATED TO J.L.T. who knew how to get it done. 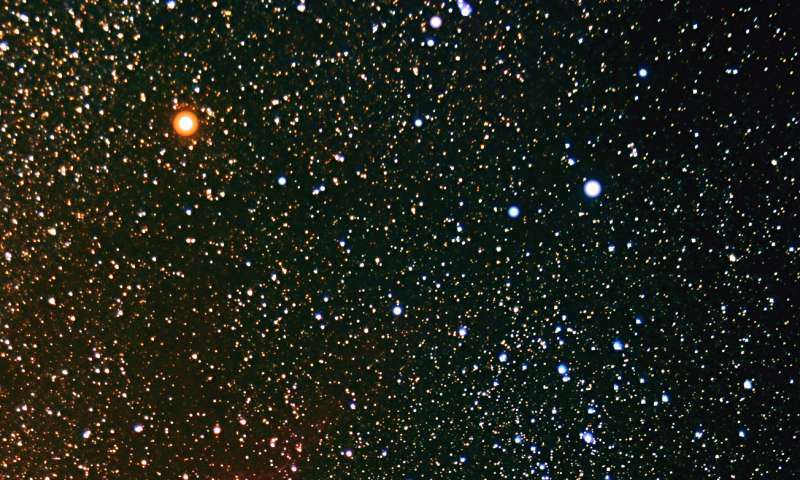 Astronomer J. Craig Wheeler of The University of Texas at Austin thinks that Betelgeuse, the bright red star marking the shoulder of Orion, the hunter, may have had a past that is more interesting than meets the eye. Working with an international group of undergraduate students, Wheeler has found evidence that the red supergiant star may have been born with a companion star, and later swallowed that star. The research is published today in the journal Monthly Notices of the Royal Astronomical Society. For such a well-known star, Betelgeuse is mysterious. Astronomers know that it’s a red supergiant, a massive star that is nearing the end of its life and so has bloated up to many times its original size. 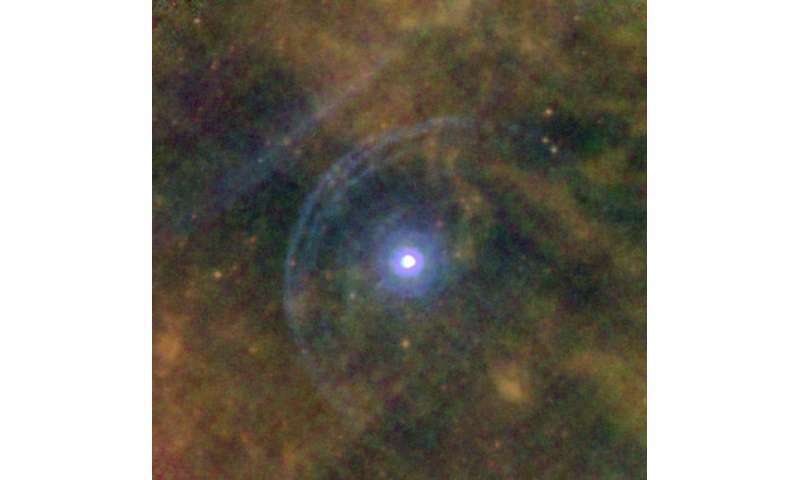 Someday it will explode as a supernova, but no one knows when. “It might be ten thousand years from now, or it might be tomorrow night,” Wheeler, a supernova expert, said. A new clue to the future of Betelgeuse involves its rotation. When a star inflates to become a supergiant, its rotation should slow down. “It’s like the classic spinning ice skater—not bringing her arms in, but opening her arms up,” Wheeler said. As the skater opens her arms, she slows down. So, too, should Betelgeuse’s rotation have slowed as the star expanded. But that is not what Wheeler’s team found. He directed a team of undergraduates including Sarafina Nance, Manuel Diaz, and James Sullivan of The University of Texas at Austin, as well as visiting students from China and Greece, to study Betelgeuse with a computer modeling program called MESA. The students used MESA to model Betelgeuse’s rotation for the first time. He explained that the companion star, once swallowed, would transfer the angular momentum of its orbit around Betelgeuse to that star’s outer envelope, speeding Betelgeuse’s rotation. Wheeler estimates that the companion star would have had about the same mass as the Sun, in order to account for Betelgeuse’s current spin rate of 15 km/sec. While an interesting idea, is there any evidence for this swallowed-companion theory? In a word: perhaps. If Betelgeuse did swallow a companion star, it’s likely that the interaction between the two would cause the supergiant to shoot some matter out into space, Wheeler said. Knowing how fast matter comes off of a red giant star, about 10 km/sec, Wheeler said he was able to roughly estimate how far from Betelgeuse this matter should be today. “And then I went to the literature, in my naiveté, and read about Betelgeuse, and it turns out there’s a shell of matter sitting beyond Betelgeuse only a little closer than what I had guessed,” Wheeler said. Infrared images taken of Betelgeuse in 2012 by Leen Decin of the University of Leuven in Belgium with the orbiting Herschel telescope show two shells of interacting matter on one side of Betelgeuse. Various interpretations exist; some say that this matter is a bow shock created as Betelgeuse’s atmosphere pushes through the interstellar medium as it races through the galaxy. No one knows the origin with certainty. But “the fact is,” Wheeler said, “there is evidence that Betelgeuse had some kind of commotion on roughly this timescale”—that is, 100,000 years ago when the star expanded into a red supergiant. The swallowed companion theory could explain both Betelgeuse’s rapid rotation and this nearby matter. Wheeler and his team of students are continuing their investigations into this enigmatic star. Next, he says, they hope to probe Betelgeuse using a technique called “asteroseismology”—looking for sound waves impacting the surface of the star, to get clues to what’s happening deep inside its obscuring cocoon. They will also use the MESA code to better understand what would happen if Betelgeuse ate a companion star. In 1839, the Congress of the Republic of Texas ordered that a site be set aside to meet the state’s higher education needs. 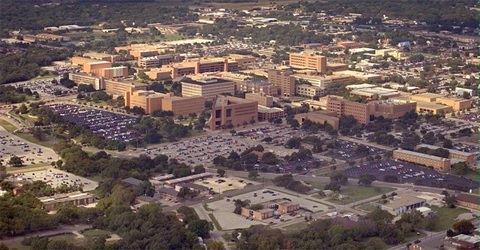 After a series of delays over the next several decades, the state legislature reinvigorated the project in 1876, calling for the establishment of a “university of the first class.” Austin was selected as the site for the new university in 1881, and construction began on the original Main Building in November 1882. Less than one year later, on Sept. 15, 1883, The University of Texas at Austin opened with one building, eight professors, one proctor, and 221 students — and a mission to change the world. Today, UT Austin is a world-renowned higher education, research, and public service institution serving more than 51,000 students annually through 18 top-ranked colleges and schools.